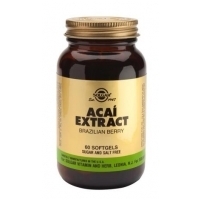 This acai berry formula is a natural source of anthocyanins, flavonoids and polyphenolic antioxidant compounds. Ingredients: Serving Size: 60 Softgels Two (2) softgels provide: Soybean Oil Softgel Capsule Shell: gelatin, vegetable glycerin Yellow Beeswax Acaí Extract (Euterpe oleracea) (fruit) – 50 mg (20:1 extract equivalent to 1000 mg of raw berry powder) Colour: caramel Soy Lecithin Anti-caking Agent: silicon dioxide FREE OF: Yeast, Wheat, Gluten and Dairy Products and are formulated without the use of Artificial Preservatives, Flavours or Colours Directions: As a food supplement for adults, two (2) softgels daily, preferably at mealtime, or as directed by a healthcare practitioner. Do not exceed directions for use. If you are pregnant, nursing, taking any medication or have a medical condition, please consult your healthcare practitioner before taking this product. Posted on March 10, 2019 by Shaun OConnor in Approved Vitamins and tagged Acai Extract 60's, Approved Vitamins, Solgar. 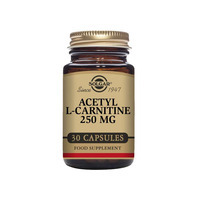 Acetyl-L-Carnitine 250 mg Vegetable Capsules is one of Solgars premium-quality amino acids. Ingredients: Serving Size: 30 Vegetable Capsules Each vegetable capsule provides: Acetyl-L-Carnitine (as HCl) – 250 mg Bulking Agents: dicalcium phosphate, microcrystalline cellulose Vegetable Capsule Shell: hydroxypropylmethyl cellulose Anti-caking Agents: vegetable magnesium stearate, silicon dioxide FREE OF: Gluten, Wheat, Dairy, Soy, Yeast, Preservatives, Sweeteners, Artificial Flavours or Colours Directions: As a food supplement for adults, one (1) vegetable capsule daily, with juice or water in between meals, or as directed by a healthcare practitioner. Do not exceed directions for use. If you are pregnant, nursing, taking any medications or have any medical condition, please consult your healthcare practitioner before taking this product. Posted on March 10, 2019 by Shaun OConnor in Approved Vitamins and tagged Acetyl-L-Carnitine 250mg 30's, Approved Vitamins, Solgar. 5-HTP is a precursor to serotonin, a neurotransmitter involved in sending messages through the nervous system. This formula also includes B vitamins to promote nervous system health and the herb, Valerian. 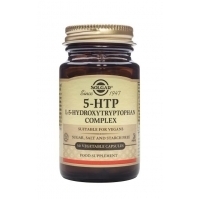 Ingredients: Each vegetable capsule provides: Magnesium (as oxide, bisglycinate) – 50 mg 5-HTP (L-5-Hydroxytryptophan from Standardised – 100 mg Griffonia simplicifolia Seed Extract) Valerian Root Powder Extract (4:1) – 100 mg (Valeriana officinalis) Bulking Agent: microcrystalline cellulose Vegetable Capsule Shell: hydroxypropylmethyl cellulose Vitamin B6 (as pyridoxine HCI, pyridoxal-5’-phosphate) – 10 mg** Anti-caking Agent: vegetable magnesium stearate FREE OF: Gluten, Wheat, Dairy, Soy, Yeast, Preservatives, Sweeteners, Artificial Flavours or Colours Directions: As a food supplement for adults, one (1) to two (2) vegetable capsules daily with juice or water, in between meals, or as directed by a healthcare practitioner. Do not exceed directions for use. Not intended for use by pregnant or nursing women. If you are taking any medications or have any medical condition, consult your healthcare practitioner before taking this product. Discontinue use and consult your healthcare practitioner if any undesirable events occur. Do not drive or operate machinery when taking this product. **Long term intake may lead to mild tingling and numbness. Posted on March 10, 2019 by Shaun OConnor in Approved Vitamins and tagged 5-HTP L-5-Hydroxytryptophan Complex 30's, Approved Vitamins, Solgar. Posted on March 10, 2019 by Shaun OConnor in Approved Vitamins and tagged 5-HTP L-5-Hydroxytryptophan Complex 90's, Approved Vitamins, Solgar.